Hey! 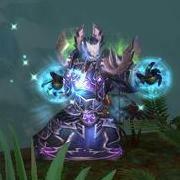 I wanted to show you guys my Warlock Transmog, as I rather like it! I'm still going for either a new set entirely, or for the shoulders to the set if they're available somewhere for non-priests.